Stack up to one face cord of firewood the easy way with Log Stacker. It keeps logs dry by elevating them off the ground and away from the walls. Use it to stack wood or other stackable items neatly on your porch, deck or in your garage, and keep your space clean and organized. 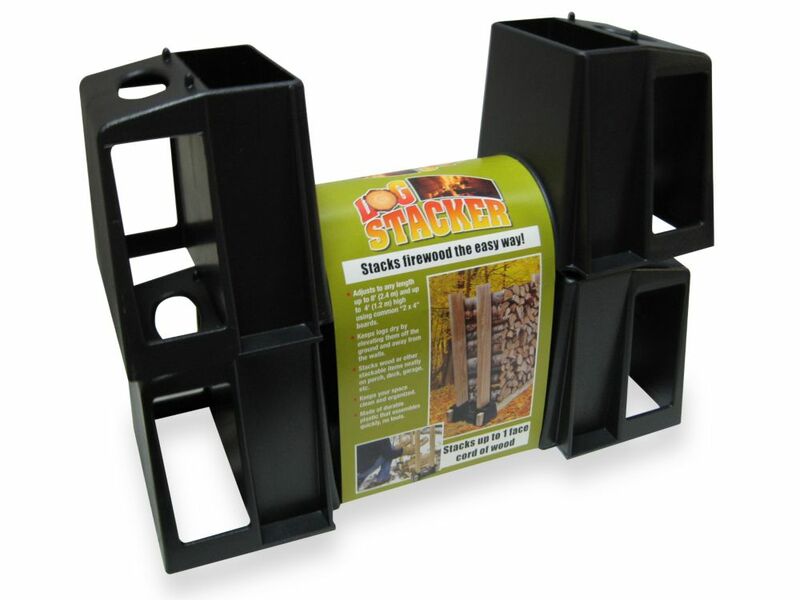 Log Stacker is made of durable plastic that assembles quickly without tools. 25cm x 36cm x 14cm (10in x 14in x 5in) log stacker adjusts in length up to 2.44m (8ft) and up to 1.22m (4ft) high using common 2in x 4in. Get protection for your firewood from rain, snow, mold and insects with our tough built galvanized steel Arrow Firewood Rack. Conveniently made to fit virtually anywhere, it's the perfect firewood storage structure that fits beneath decks, on your patio or in mudrooms. Its pent roof eliminates water from accumulating on the top of your storage structure, keeping firewood dry and ripe for kindling. Its open front and back allow for adequate airflow, allowing your firewood to be well ventilated at all times during storage. Stores 1/4 cord of wood. Mocha color with onyx trim. Log Stacker Extendable Base for Firewood Storage Stack up to one face cord of firewood the easy way with Log Stacker. It keeps logs dry by elevating them off the ground and away from the walls. Use it to stack wood or other stackable items neatly on your porch, deck or in your garage, and keep your space clean and organized. Log Stacker is made of durable plastic that assembles quickly without tools. 25cm x 36cm x 14cm (10in x 14in x 5in) log stacker adjusts in length up to 2.44m (8ft) and up to 1.22m (4ft) high using common 2in x 4in.